Deal of the Week is back! Please be sure to sign up! Great Game Products and Audrey Grant won the "ABTA 2014 Software of the Year" for the Daily Bridge Column. 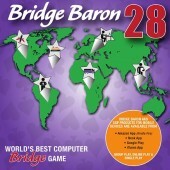 Have ideas or improvements for our upcoming Bridge Baron 29? We want to hear from you! Click here to access our survey. E-Book collection (Kindle and iBooks) available now! To acquire Bridge Baron Teacher please access your app store from your iPad and search for Bridge Baron Teacher and install it for free. 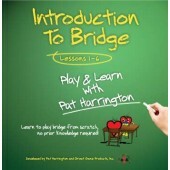 Once installed you will create an account and then select "Get More Lessons" and select "Patty Tucker - Bridge in a Day" by clicking on "Purchase/Activate button and complete your payment process and the lesson will be added to your list of available lessons (My Lessons). Totally Bridge for iOS available now! 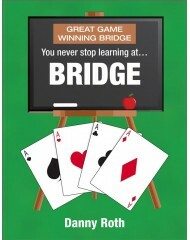 Totally Bridge for iPad and iPhone available now! 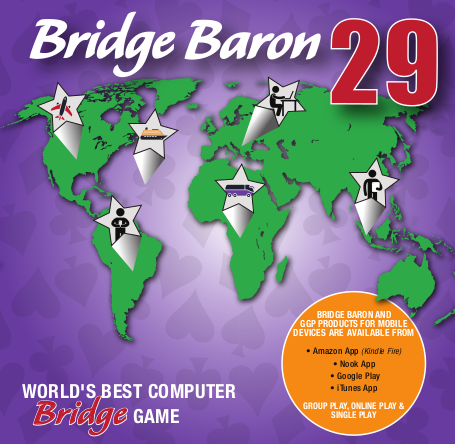 We are pleased to announce that Bridge Baron has finished 3rd place in the Round-Robin World Computer-Bridge Championship. It was really close and only 2 points separated us from first place. It was an impressive outting and we are very pleased with the results. We look forward to next years events! In conjunction with Audrey Grant, Great Game Products and Audrey Grant have won the "ABTA 2014 Software of the Year" for the Daily Bridge Column. Click Here to try the Audrey Grant's Interactive Daily Bridge Column on your computer, or search the App Store on your iPad for "Audrey"
- "Thanks for the great product. I have been subscribing for the last two months. I have improved my game a lot! The format makes it easy to learn. Money well spent." - "This is the best bridge lesson ever! I am subscribing right now and looking so forward to my next lesson. Thanks so much. 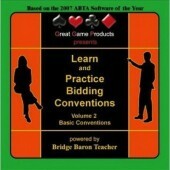 A must to improve your bridge." - "VERY logical & understandable explanations to (what I think) are complicated hands. Thanks !!!"